Marseille Metro is a very regular, clean and cheap means of public transportation in the city that is also fully integrated to the overall transportation network. The fact that it is completely air-conditioned makes for good news for the commuters and visitors planning on visiting the city during the summer months. The announcements inside the network are at present carried out in both the French as well as the English languages. The entire Metro network of Marseille is criss-crossed by a system of two tram lines and as many as thirty different bus routes. L’Estaque, which is a small town in its own right but largely regarded as an arrondissement of Marseille by the French population, can be reached by any train that runs in the direction of Miramas from the Marseille Saint Charles Station. The main train station in the city, Marseille Saint Charles, features stops for both these routes while further down the network in the southern suburb of Castellane, there is another point of intersection for the two lines. An aspect of the Metro service that the nighthawks found to be grossly annoying was the early conclusion of daily services. This also heavily factored in Marseille having an underpowered nightlife. However, with the extension of services in 2013, that scenario is slowly but surely taking a turn towards improvements. The system length is 21.5 Km with 28 stations. It takes a daily ridership of 210,000 & annual ridership of 76.7 million as in year 2012. 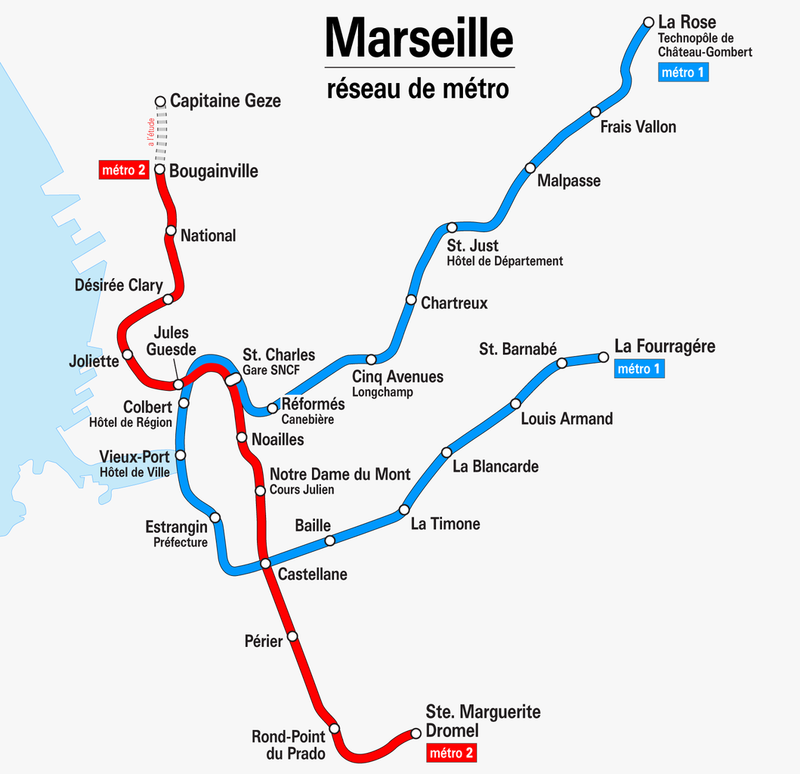 There are two underground lines that serve the Metro network in Marseille. The Blue Line- M1- runs roughly along an east-west direction before returning back in a broad loop line. The Red Line- M2- is one that roughly runs in a north-south direction. Note: The metro lines are line M1 and M2, respectively. Tickets can be bought from cafes at subway stations. The metro tickets allow unlimited access to trams and buses with initial use of 1 hour time period. The base price of ticket is 1.50 Euros, this is the fare of a 1 Trip ticket. After 1 hour re-entry can’t be done on the same ticket. A 2 Trip ticket costs double, at 3 Euros. A multi journey ticket is best option it covers buses , metros and trams and costs 13 Euros per 10 trips. There is a card known as the Group Card 4 Pax, this ticket allows a group of 4 to travel for a consolidated fare of 4.80 Euros. For those who are frequent users of the public transportation system in Marseille, 24 and 72 hour tickets are also available. They both cost 5.20 Euros and 10.80 Euros, respectively. Map of Marseille Metro showing various lines and stations. Click on the map to enlarge it or Download Marseille Metro Map in PDF. Park and ride facilities are available at most of the stations of the Marseille metro. However, a fee may have to paid to avail these services. Those who hold the Pass XL permanent, get to use the facility for 30 days for free. Others have to make payment through a transportation card. For the first 3 hours it costs 30 cents for every 15 minutes. For those who use the facilities for 3-12 hours, it costs 10 cents for every 15 minutes. Ultimately, for those who use the service for 12-24 hours it costs just 30 cents for every hour. The Marseille metro has strict rules when it comes to the issue of tickets. A fine can be imposed on anyone who gives their tickets to a third person. It is advised to handle your ticket with care, till the very end of the trip. For safety purposes, more than 250 officers patrol the area for all the 24 hours of a day. Cameras are installed in all trains, busses and trams for surveillance purposes.